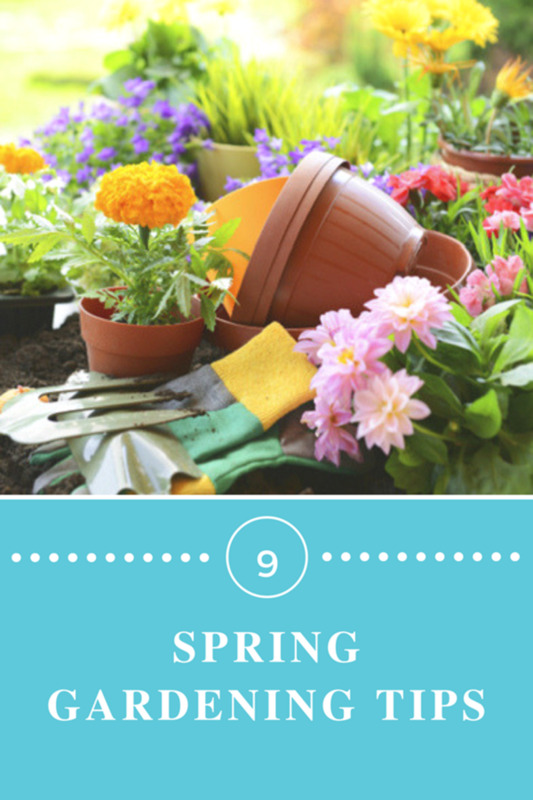 Some gardeners are fortunate enough to live in a climate that has a year-round growing season. Most of us, however, live in an environment that experiences some degree of winter and a cessation of plant growth. Preparing your garden for the winter season is important, as it lays the foundation for next spring's growth. Trimming back fading perennials, clearing out weeds, and performing other vital garden tasks will make your gardens healthier when the growing season resumes. Most autumn garden chores do not have to be performed all at once. Some perennials add interest to the garden late into the fall season, so they may not be cut back until the first snowfall arrives. Weeding and mulching are much more pleasant tasks when the weather is mild, so these should be done in early fall. Over the spring and summer, debris slowly accumulates in the garden beds. 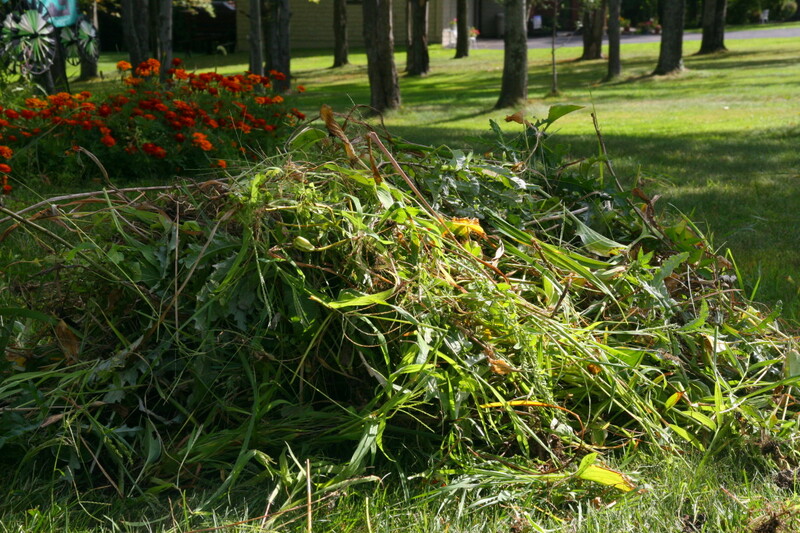 Fallen leaves, decaying plant material, sticks, and other items blown in by the wind can make garden beds very untidy. Use a small rake and pull out leaves and other debris from the garden beds. Weeding is another important task for fall. 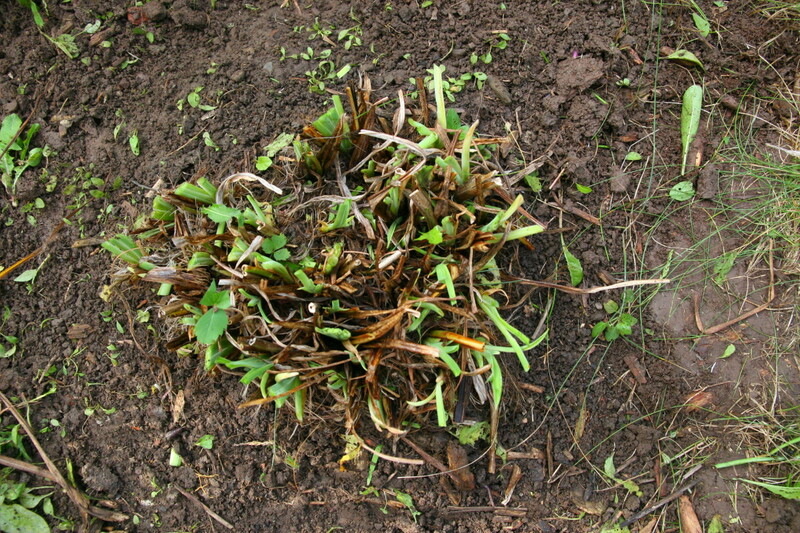 Don't leave weeds in the ground, as they will come back with vigor next spring. Pull out all visible weeds, taking care to get the entire root. Some weeds (like thistles) are extremely difficult to eradicate. Pull these out so they don't have a chance to flower and set seed next spring. Check your vegetable gardens and harvest any crops before the first frost. 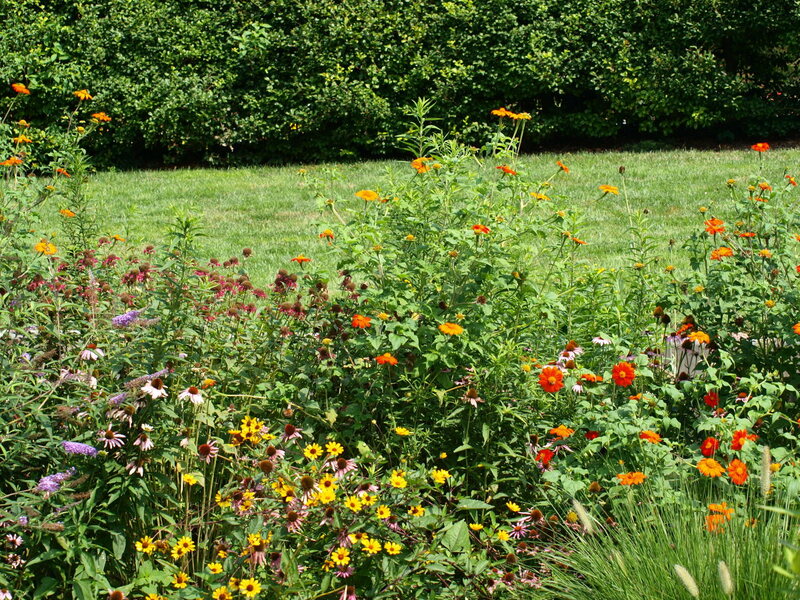 Most perennials need to be cut back in the fall. 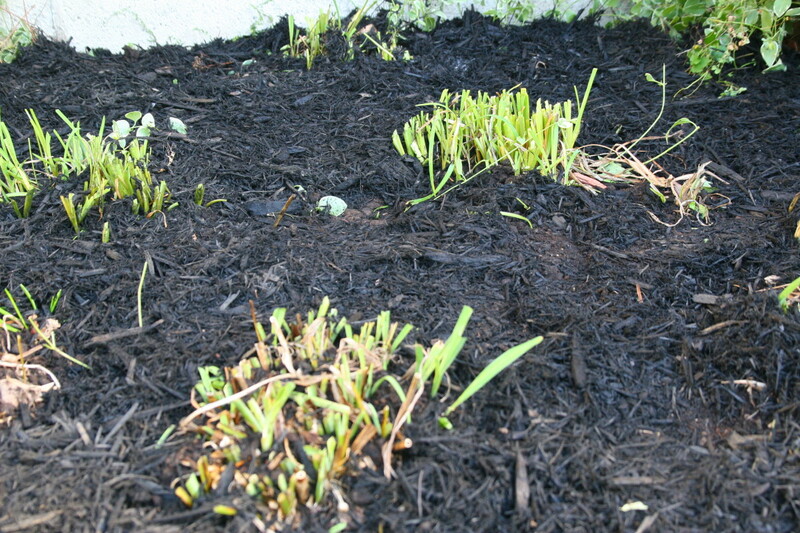 Plants like daylilies will have a mat of dead leaves surrounding the plant. If these are not cut back now, the plant will have to grow through them in the spring. The decaying, brown leaves look unsightly and should be cut back to a couple of inches from the ground. Some plants should not be cut back in the fall. Plants like Butterfly Bush (buddleia) should not be pruned until spring. Know your plants and the recommended pruning times, as some plants will only flower on new growth after a spring pruning. Echnicea (cone flower), Rudbeckia (black-eyed Susan), and sunflowers are often not cut back in the fall, as they provide seeds for the local bird population. These flowers can also add a structural interest to the garden, so it is not necessary to cut them back until the spring. Fertlizing plants in autumn helps the plants to develop strong root systems. Since the plants are not putting energy into flower development, the extra nutrition is used by the plant to strengthen the roots. Use a good compost mixture (the "black gold" of any gardener's arsenal) and work it into the soil. Loosening the soil when adding compost performs another garden task: grubs and other garden pests are revealed. Throw these out of the garden and leave them exposed: the birds will get an extra snack and your garden will have fewer pests next spring! Apply a 3" to 4" layer of mulch on your garden beds. The mulch helps retain moisture, prevents future weed growth, and helps insulate the plants from temperature extremes. There are many different mulch varieties on the market - bark mulch is often inexpensive and will cover a garden bed quickly. The seeds from many plants may be collected and stored over the winter - simply plant them in the spring for fresh, new garden plants! 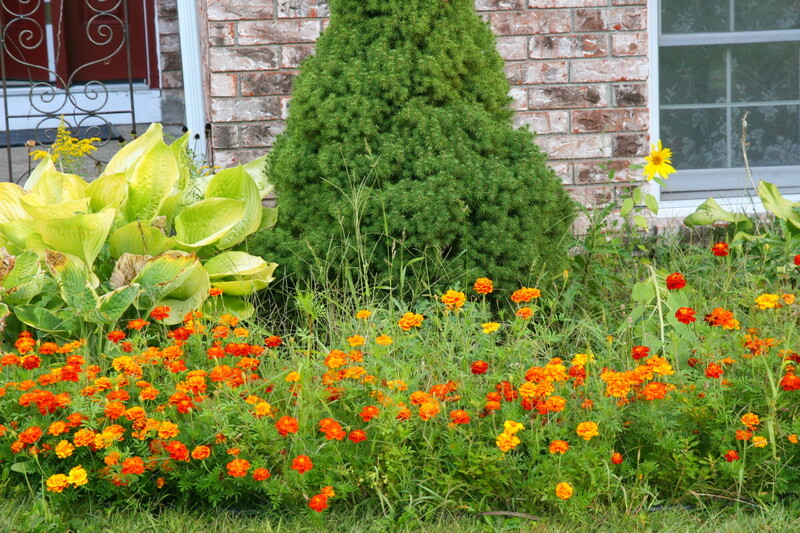 The marigolds in the pictured flower beds were all grown from seeds collected the previous year. Store seeds in a marked envelope and keep them in a cool, dry location until planting season arrives again. Some evergreens may be split by heavy snowfall. In these environments, wrapping the bush or tree with burlap will spare damage from snow packs or snow sliding off the roof. Simply wrap each evergreen in burlap and secure with twine at regular intervals. Perform this task just before the first snowfall is expected. 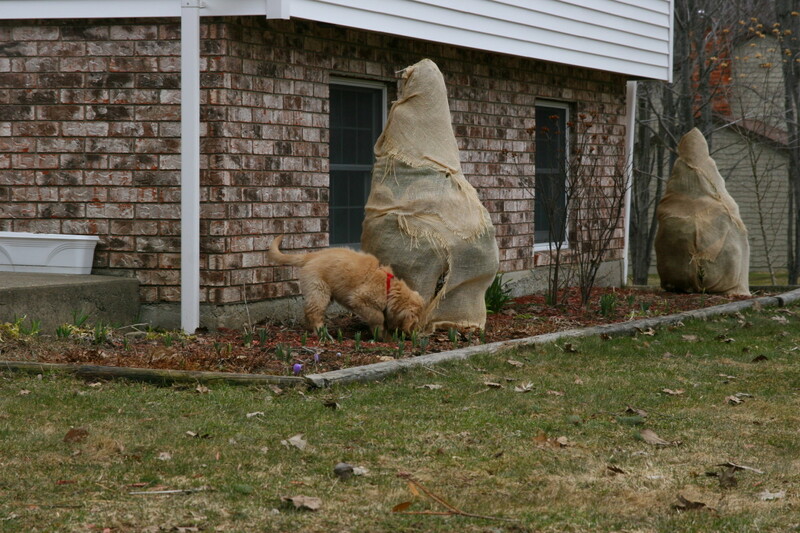 Remove the burlap in the spring, after the danger of heavy snowfall is past. Clean all garden tools with soap and water. Remove all traces of dirt, plant material, and rust. 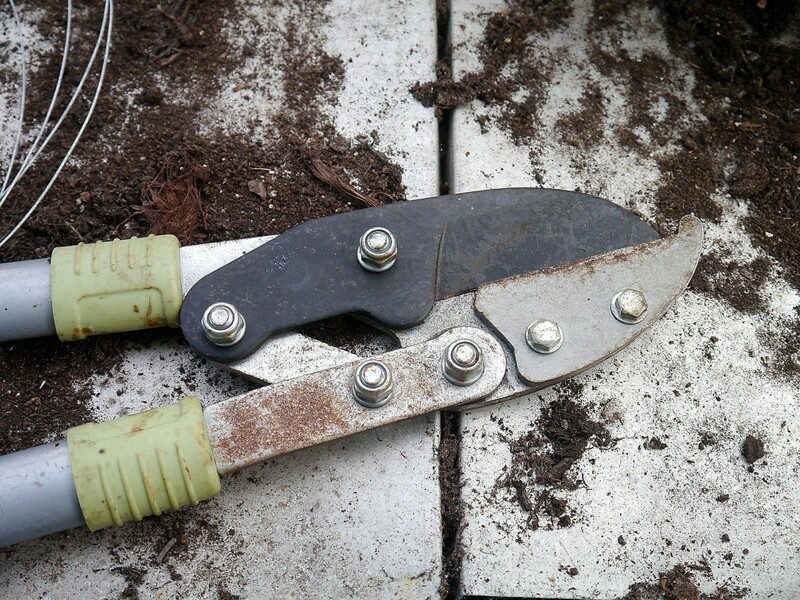 Sharpen pruners and other cutting equipment Sharpen pruning shears with a whetstone, at the same angle as the blade. Before putting the garden tools away for the winter, coat the tools in a fine layer of oil (some gardeners use motor oil, others use linseed oil). One storage idea is to fill a 5 gallon bucket with sand, and pour oil into the sand until it is wet. Simply store the garden tools (spades, hand-held rakes and hoes, etc.) in the oily sand over the winter. Deer and other animals become hungry in the winter and will feast on the bark of your trees and will devour rhododendrons and other evergreen garden plants. Place deer fences around trees and use deer netting over plants that may be attacked over the winter season. Another option is to use a deer repellent like Liquid Fence. This liquid (made from putrefied eggs) does a fantastic job at keeping deer away, but might be difficult to spray in the frozen winter months. Early fall is an excellent time to divide perennials. It is often rainy in early fall and the plants benefit from the added moisture by putting down strong root systems. Do not divide perennials late into the fall season, however, as frosty weather and transplant shock may be damaging to your plants. Peonies, in particular, do best when divided in the autumn. Any perennial that shows less growth in the center, becomes overcrowded, or hasn't been divided in 2 years needs to be divided. 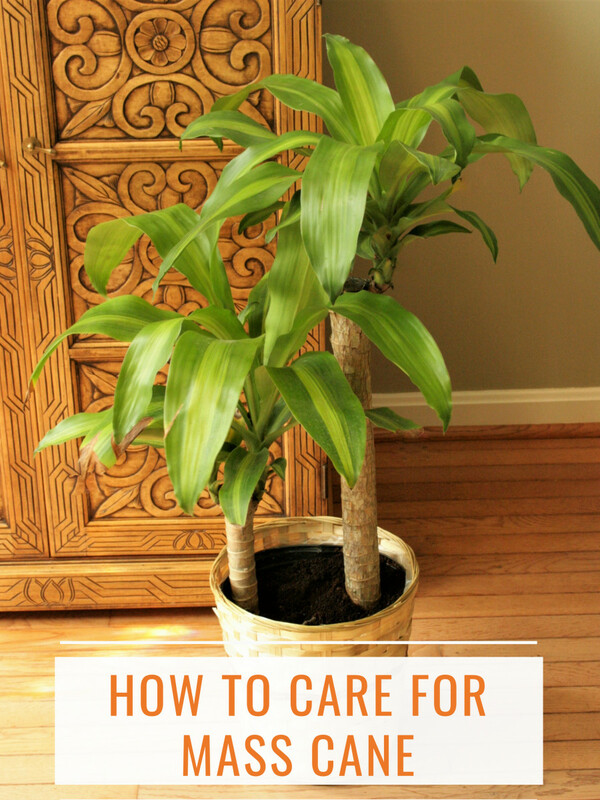 This is an inexpensive way to get more plants for your garden! 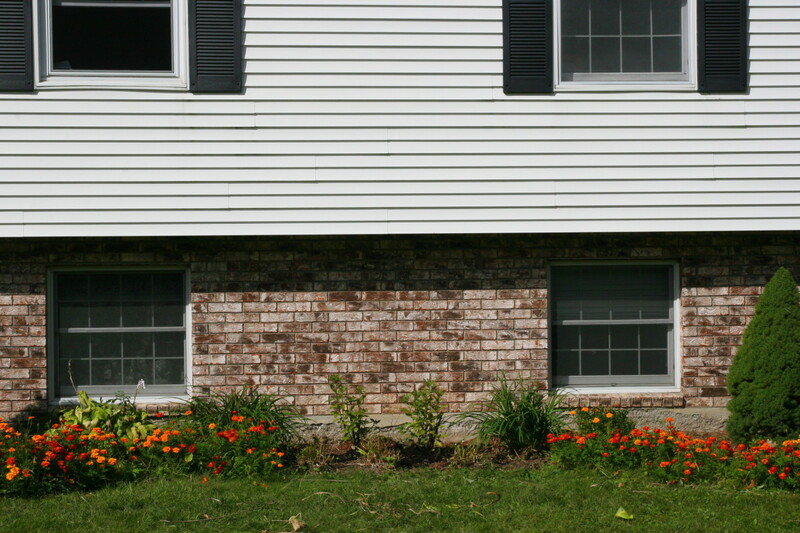 Plant daffodils, crocus, and other spring bulbs in autumn to see a burst of color next spring. Summer-blooming bulbs like lilies may also be planted in the fall. These bulbs will have better blooms if planted in the fall (as opposed to the typical spring-time planting) because they will have had more time to establish in the ground. The amount of debris pulled out of the garden during the autumn clean-up is perfect for a compost pile. If you don't have one, start one now. A three-sided square pit made of hay bales or chicken wire is sufficient. Take care not to throw weeds into the compost pile, however, as the seeds will remain and sprout next spring. Those who live in areas frequented by wildlife may want to invest in a system with a lid, to keep deer and bears out. Turn the compost at regular intervals, and the pile will keep itself warm throughout the winter months with the heat created by decay. In the spring, you will have a fine pile of compost to spread on vegetable gardens and flower beds. What is your least favorite fall garden chore? I still have a few tasks to do, rbm, but thankfully I'm almost done with all of our garden clean-up! I still haven't wrapped our evergreens in burlap, and I have a few hostas to cut back now that we've had the killing frost. Good luck with your yard work! Fall is definitely here, and winter not far away either. We're getting ready to tackle most of those tasks. Good hub and good suggestions. Voted up and useful. I do like the seasonal change, greatstuff. Winter can become extremely long - the lack of sun and the unending snow is difficult after about 3 months (our winters can last for almost six months), but the fall and the spring are gorgeous! I miss being able to grow tropical flowers, but autumn is certainly gorgeous! Congrats on HOTD. We always think the grass is greener on the other side - coming from a tropical country where, as you said it, that has a year-round growing season' can be boring. The seasonal change is more fun and visually interesting. I did not know that you have to wrap evergreen, to protect from the weather and deer! Interesting but can also be a chore. Wow, there are many responsibilities to have a garden! Great work. Thank you, J.S. Matthew. We live in the Great Lakes region and get a lot of snowfall, but fortunately have moderated temperatures due to the presence of the lakes. We are zone 5, though I can get away with some zone 6 plants - a little work in the fall saves a lot of work in the spring! It is hard to know what tasks need to be performed at what times, SmalltownGirl! Peonies do best when divided in the fall, but some types of clematis can ONLY be pruned in the spring! Fortunately, most of my plants can be divided or pruned at any time of the growing season. Wow this is a really good Hub! Congrats on the Hub of the Day! Well deserved. 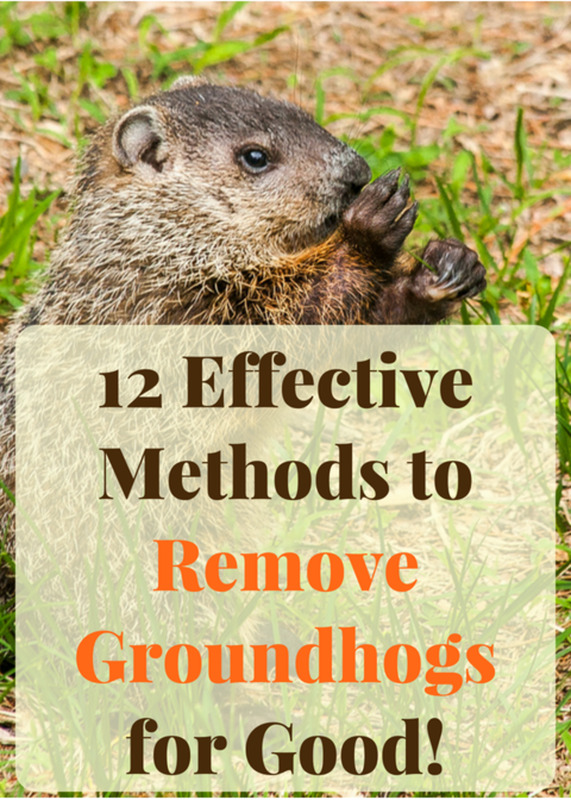 As a New Englander, these tips are very useful to maintain a healthy garden year round. Voting up and sharing. Great and useful information! I never know what to do when. This helps a lot! We didn't use to wrap our evergreens, Farmer Rachel, and one year a snow pack split a beautiful shrub in half. It was so damaged we had to remove it in the spring. Now we make sure all of our conical evergreens are wrapped, in addition to anything under the eaves where the falling snow pack can do some serious damage! The deer prevention is an added bonus. Yes, winter is coming soon, jpcmc! It is time to get all the fall chores done now, if they haven't been done already! Thanks, Victoria Lynn! I always dread the big clean out at the end of the growing season. I should probably weed constantly, but it often gets away from me and I have a big job at the end of September! So many things to do. But it's essential that we get to start ASAP. Great info. I need to do some of that. I dread it, though. Thanks for the reminder. Nice hub, and congrats on HOTD! Armchair Builder, pulling weeds is my least favorite chore, too. I'm not a big fan of getting the leaves out of the shrubs, either. I LOVE my gardens, but I'm not a huge fan of all the work it takes to get them looking so beautiful! MarleneB, the Liquid Fence really works. The only bad thing is it smells AWFUL. It is made from putrified eggs - if you decide to use it, pretend that you don't know how to use the sprayer and con your husband into doing it. There's another product called Deer Out and it smells like peppermint - I haven't tried it yet so I can't vouch for its efficacy. But the Liquid Fence works like a charm. You can get it online or from a store like Home Depot or Tractor Supply. StephanieBCrosby, I might have considered coming over to winterize your yard... if I hadn't just finished my own! Oh, it is a lot of work to clean out those beds! I have to say, though, it does get easier as the kids get older. 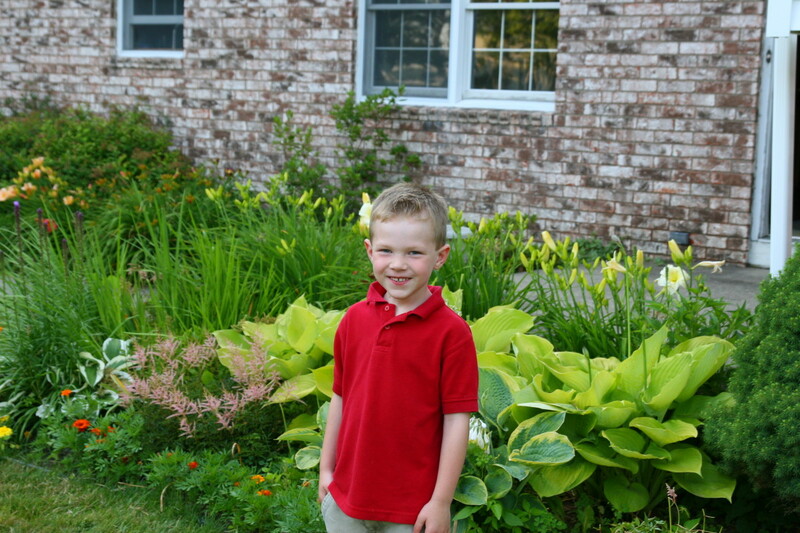 My six year old will fill his Tonka truck with weeds and help me clear everything out of the yard. Pulling weeds was my answer...although I hate raking leaves out of the shrubs. Thanks for sharing. This is a handy reference guide for getting the garden ready for spring. I enjoyed all the tips. I was especially interested in reading the information about the liquid fence. I've never heard of that and will now look into it, because every time my husband and I drive out to our retirement property, the deer are all over the place. I was wondering how I would keep them from my plants because it looks like they can jump right over regular fences. Thank you for all of the tips and now after watching the video I know how to divide my perennials. This is a really good article for every level of gardener. So, here's my question for you, "Can you come winterize my yard?" I tend to run out of energy when it comes to properly preparing the gardens for the next season or year. Maybe this will change as my kids get older and I have more time to dedicate to gardening. Thanks for all the helpful tips as usual. And congratulations. I am glad my work is now done, RTalloni, and hope the guide helps others who are putting their gardens to bed! Thank you! Such helpful information you've put together for us in an easy to read format. 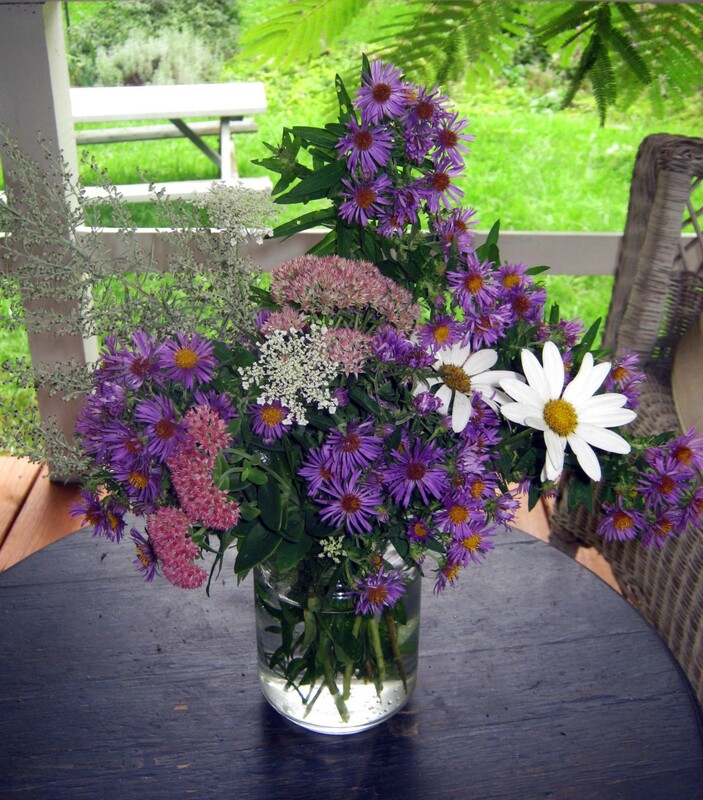 Congrats on your Hub of the Day award for this great fall gardening guide! Thank you, Rebeccamealey! I can't believe how quickly autumn arrives every year. I'm already looking forward to the next growing season! This is a wonderful guide for preparing the garden for winter. You covered everything so well. Congratulations! Sorry that I had to add to your "to-do" list this fall, Shasta! It is definitely a lot of work, but well worth it when the garden is clean in the spring. I am not looking forward to winter, but at least my garden is done! Congratulations on Hub of the Day, Leah. I hesitated reading this because I don't want to add any more to my list of things to do, but these are great tips of the things that need to be done around the yard, and yes, they are on my list now. I used to do little flower boxes when we had an apartment in California, watergeek. I had a need to garden, even when we had very little space! It is difficult to garden on a balcony, though - we have an acre now and I cherish every square foot. I miss having a garden. It was a great way to calm myself, get centered, and feel like my house was my own . . . condo, actually. (I wasn't supposed to be gardening, but did.) Congratulations on Hub of the Day, Leah. I have never tried to divide a palm tree, ComfortB- I hope it is not too difficult to do! Our daylilies are fairly easy to divide, but the astilbe get quite large and can be difficult. I love dividing them, though, because we have so many "free" plants when the job is done! This is a very informative hub. I've been trying to figure out how to divide and replant my Sago Palms. Found a link through your Youtube video. I'm glad I don't have to do a lot of weeding anymore since we put in a new rock garden. I do need to go ahead and cut back my lilies, maybe even divide them up for re-planting. Thanks for this hub. Congrats on the HOTD award! Voted up and useful. I love our fall leaves - not the raking, but the jumping into piles! My kids adore autumn, alifeofdesign. This is my favorite time of year, despite the weed-pulling tasks that I despise. We have frost on the lawn and brilliant red leaves as I type - I wish this season would last for months instead of weeks! Aside from all the leaves we have, I like fall cleanup., it gets me in the mood for morning hikes and apple picking. I enjoyed your hub.. Thanks, Dirt Farmer! We are able to protect the garden from deer, but protecting it from Golden Retriever is another matter entirely. He likes to "help" with our garden chores! Planting bulbs is probably my favorite garden task. Very little work for a nice, colorful surprise in the fall! I hope you get to plant a lot of bulbs this spring, Cathy Fidelibus! The gardening tasks will definitely vary by region, pstraubie48! We have a great deal of work in the spring and fall with our heavy snowfalls, but the work in Florida is probably more constant, since your growing season is year-round! The deer can certainly be pesky - we use a combination of physical barriers (like burlap) and all-natural deterrents (Liquid Fence - smells awful but is extremely effective)! Eiddwen, I absolutely love gardening, too. I spend a great deal of time looking at seed catalogs over the winter months! I am rather sad that our gardening time of year is coming to a close! Fall is such a lovely time of the year. It is not really too fallish here in FL but the weather has cooled enough so evening working in my yard has not been sweating to the oldies time. I do some of the things you suggest here like protecting plants from the cold. My friends out in the Ocala National Forest have to address the deer who visit their plants though. Your helpful suggestions are being bookmarked. Pauline, the Isle of Man has to be absolutely beautiful. Window boxes are so pretty in the summer - I once visited a town with gorgeous boxes on every window. It was stunning! I hope you have a nice fall, especially since your weeding tasks are probably kept to a minimum with the prominence of container gardening! This is a lovely hub - it's a bit like the island I live on - everything close to hand and compact. It's really useful, as all the information I would usually get from gardening books ( and I have many) is all here, clearly set out, ready to go. Thanks, lindacee! I love gardening - it is so soothing and I love being outside in the sunshine. I think our (extremely) long winters have developed a keen appreciation of sunshine in me! I would miss having a yard, too. I wouldn't miss weeding, though, especially weeding nettles and thistles (my hands are still sore, despite the use of gloves)! What a thorough Hub detailing fall garden projects. Wow, I really miss having a yard to putter around in. However, I think when I had a yard, I complained about all the seasonal chores. ;) You know, I never spent the time cleaning my garden tools properly and always kicked myself in the spring when I had to deal with the built up gunk and rust! BTW, your landscaping is beautiful! My boys love to help pulling weeds, too, CassyLu! They put them in their big Tonka dump truck and haul them to the woods. I have a feeling their enthusiasm will fade as they get older, though. I still can't believe fall is really almost here! leah - this is an incredible article! I have to do most of these tasks and have been putting it off LOL I've actually gotten my son to enjoy pulling weeds so maybe this weekend him and I will tackle that part (as it is my least favorite to do). Great hub :) Voted up and shared!!! Hi teaches - that is our front door. I love red doors and was very happy when we put this one in - it also has a window, which lets in more light in the winter. I'm originally from Southern California, and the garden upkeep was very different there. The fall chores didn't exist, because the garden never really went to "bed" for the winter. Weeding, unfortunately, is a task that exists in every climate. I bet South Florida is absolutely gorgeous. I really want to see the everglades one day! Is that your front door? Well, it is just beautiful and reminds me of the door leading to a great adventure! Lovely. We don't have to do these fall garden tasks here in South Florida, but still have tools to clean. Thanks for the share and great tips. I agree, Lipnancy - I love fall, but always dread the winter season. I love November and December, but January through March drag on forever! I love gardening, Om, but not the weeding that comes along with it! We have two major "work" times of the year with our cold climate. The first is in spring, when a major clean-up and planting occurs. The second is fall, where everything has to be cleaned up and "put away." It is a lot of work in those two seasons, but the winter has no work involved. In warmer climates, you have to tend to a garden constantly (with a lower level of work), so it probably evens out in the long run! Wow, I never imagined the winter season would come with so many responsibilities! These tips are really great, Leah. 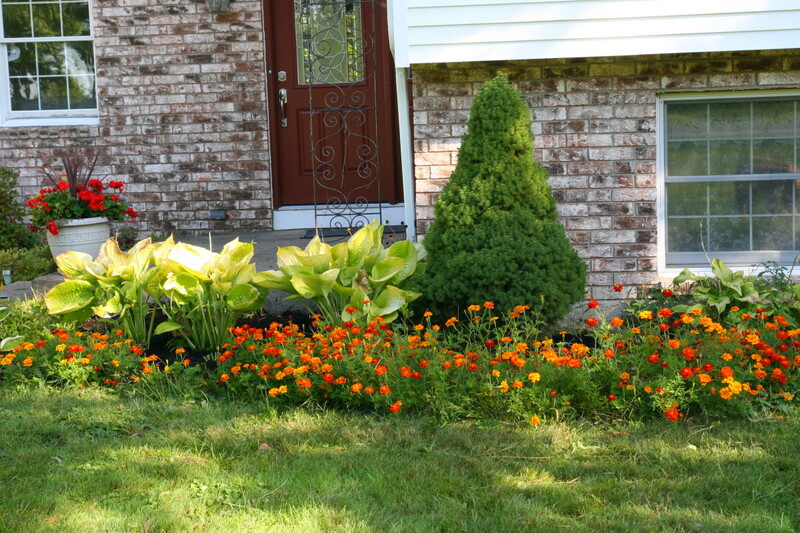 As a child, I used to live in a house with a big flower garden (it was a perennial garden, though). Now I miss having a garden quite a bit, yet at the same time, I also feel grateful for not having to do all these gardening chores. Your Cousins, the planting season can vary by region. Some bulbs require a significant period of "chill" to perform well, so if you don't have cold enough weather for daffodils, etc. 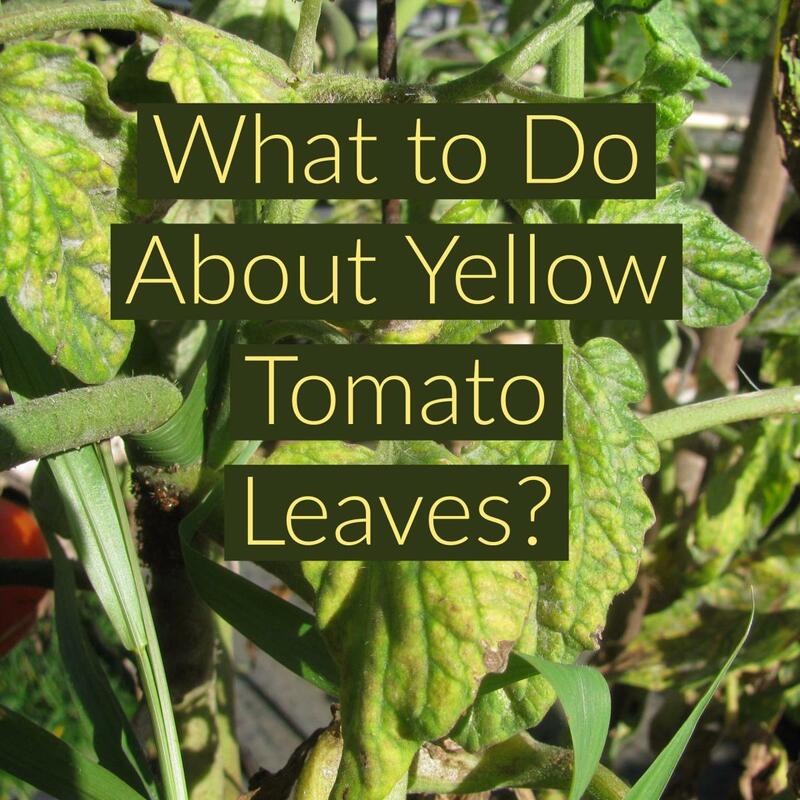 you can try putting them in the refrigerator for a few weeks before planting. I live in rural New York and we must plant our bulbs in the fall, because the ground is frozen and under three feet of snow in the winter! Thanks for the hub. I have always planted my spring bulbs in the winter, but some of them don't produce on schedule. I will try your advice and plant them in the fall this year. Wish me luck. Voted up and awesome.